It was a few days before New Year’s Eve, and my significant other and I were trying to come up with a plan for our special date night in Cleveland. Some friends of ours mentioned Scene75, a newly opened entertainment center in Brunswick, was having a New Year’s Eve bash, so we decided to pair up with them to check it out. As it turns out, this hot spot was the perfect place for our special date night in Cleveland! Upon entering the venue, my face lit up as I took in all of the sights and sounds; I felt like a five year old on Christmas morning! There were so many exciting things to see and do, and within minutes upon entering, I was fully ready to explore. The best part of this specific date night in Cleveland proved to be that Scene75 offered something for everyone to enjoy. To start our adventure, we made laser tag our first event of our date night. Why? Because somehow I managed to make it to my adult years without ever playing laser tag! As soon as we entered the two-story, black light arena, I wondered where had laser tag been all of my life! The arena’s atmosphere made me feel like I was actually an undercover agent, and I was totally immersed in the experience – sneaking up the ramps, hiding behind walls, and attempting to outsmart my opponents. Based on my personal score displayed on the screen at the end of our mission, I quickly realized that I need to work on my aim! Wow, was I bad – but I had so much fun! 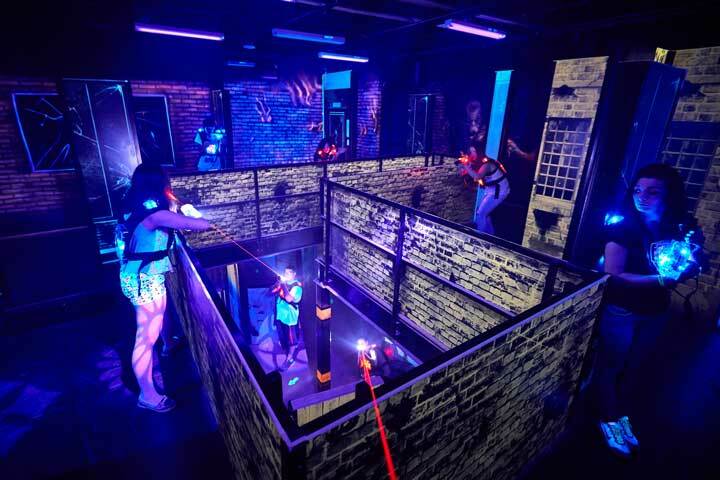 Since we had decided to join forces to be on the same team for laser tag, we wanted to switch it up for our next attraction and add in some competition. Mini bowling sounded like a unique challenge for phase two of our date night in Cleveland! After making a quick stop at the huge center bar for some cocktails, we made our way to the mini-bowling lanes. I have never been a phenomenal bowler, maybe because I always choose a bowling ball that is either too heavy or too small for my fingers, but mini bowling proved to be the perfect solution for me. The ball is about the size of a softball, and I was easily able to wind up and “pitch” the ball down the lane, getting strike after strike! I have to say I was much more pleased with my final score at the end of this game than I would have been on regulation lanes. 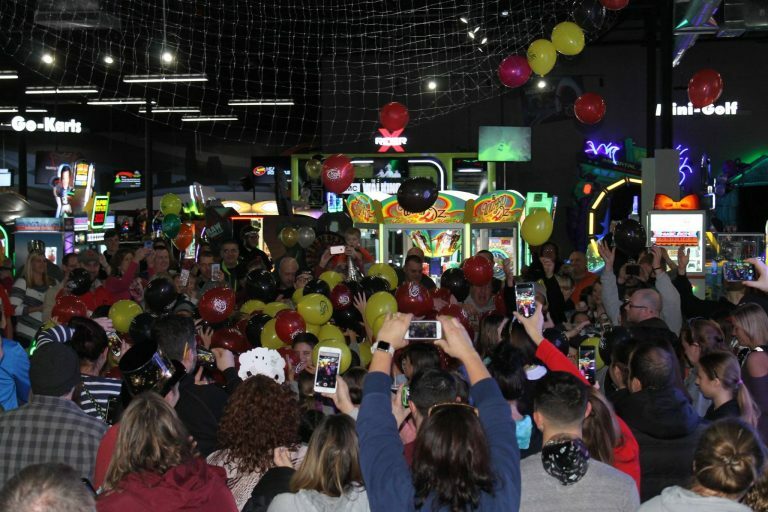 We still had time before Scene75’s New Year’s Eve balloon drop, so we headed over to try the virtual reality attraction. We signed up for a timeslot, and while we waited for our turn, tried our hand at the arcade games. There were well over 100 arcade games to choose from including old classics, claw machines, coin pushers, new adventure video games, and even traditional fair games! Playing some arcade games made our short waiting period fly by, plus we racked up some prize points to redeem for candy and fun knick-knacks at the end of our date night. But now it was our turn to suit up with virtual reality headsets and venture into another world for the next 20 minutes! I am not a huge fan of horror films, but my boyfriend LOVES them. Brookhaven VR was a perfect game for him as he entered a post-apocalyptic world to fight off zombies. The rest of our group was looking for something a bit more mild. I chose the career simulator and whipped up some tasty diner meals as a gourmet chef. One of our friends is quite the artist and chose the painting game that turned her world into a limitless canvas. I found my experience with virtual reality to be so enthralling that it took me a minute to realize what was happening when the staff member called time and took off my headset. Once we all made the adjustment back to the real world, we had just enough time to join the crowd forming around the center bar to wrap up our date night in Cleveland as midnight approached. The glittering globe in Times Square could be viewed on every screen, and we all put on our New Year’s crowns and glasses to add to the festivities. I looked around at all of the other couples, families, and groups of friends laughing, smiling, and having a good time. While everyone seemed to spend time at Scene75 in their own, personalized way, each seemed to share the same smiling expression. As the countdown began and the clock struck midnight, a boisterous “Happy New Year” rang through the building and colorful balloons drifted down from the ceiling. It was such a colorful sight and a truly memorable way to end our 2017 with a fun date night in Cleveland. Since none of us are true night owls, within the hour we were ready to head back home for the evening. Since there were still so many attractions and games to explore, so we knew we had to come back again very soon. We had a fantastic time ringing in the New Year with some friendly competition, lots of laughs, and of course a glass of complimentary champagne! 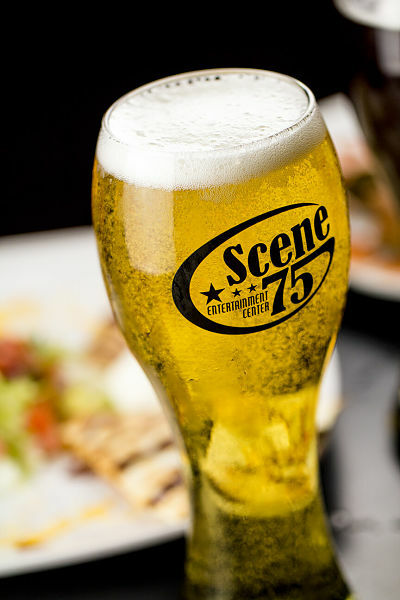 Our date night in Cleveland at Scene75 was certainly one to remember!